Food Network host Guy Fieri takes a break during filming for an episode of Diners, Drive-Ins and Dives. The show was doing a segment on R & R Taqueria, which operates out of the corner of a Shell Station in Jessup -- and is about to become much more crowded. Owner Rodrigo Albarran originally moved to the US from Mexico City to work as a commercial pilot. 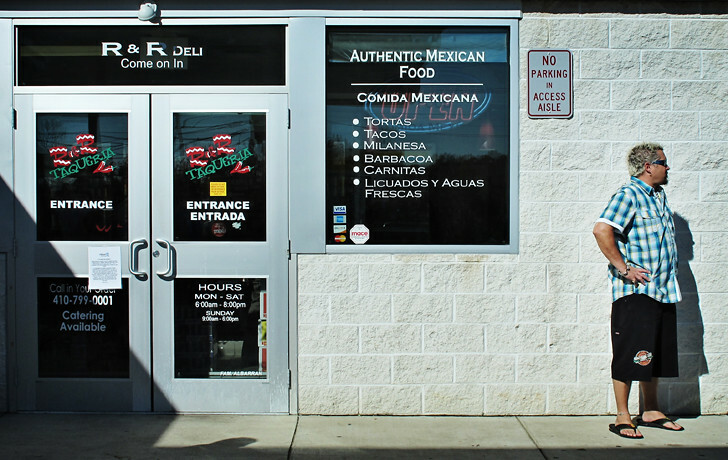 When he was furloughed, he shifted gears and opened what has quickly become one of the most popular authentic Mexican restaurants in Howard County. If you want to be able to say you knew about R & R before they were famous, you'd better get over there before the segment airs in mid-December. After that, it'll be too late. Highly recommend: The Carnitas tacos.